The excavation of burial grounds gives us enormous insights into the past, but discovering that your development will impact upon an historic cemetery can be somewhat daunting. So how can you mitigate for this? Firstly, a desk-based assessment will help you to know what to expect. Historic maps show the outline of past cemeteries. In London, we can call upon the detailed observations of Mrs Basil Holmes, who undertook a survey of disused burial grounds in the 19th century. MOLA's GIS systems and access to historic Ordnance Survey data, allow us to rapidly determine if there is a documented burial ground in the location of your development. Further research can often provide an estimate of the number of individuals interred and the date of use. 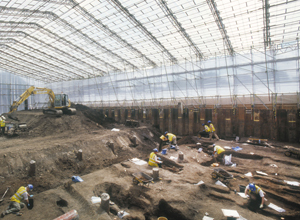 If you commission a desk-based assessment pre-site acquisition or in advance of final scheme design the findings from the assessment can be used to inform decisions and progress developments, appraised of the archaeological risk. Should your development impact on a burial ground, expect that you will need to excavate all the human remains affected. Before this can take place, an exhumation licence must be obtained from the Ministry of Justice; unless the site is consecrated (Church of England) and the remains are being re-interred in consecrated ground, when a faculty is required. The licence will specify how the site is to be screened, and where and if the remains are to be reburied. If human remains are found during a development and they were not previously expected, they should be left in situ, archaeological advice sought and an application for a licence made to the Ministry of Justice. Once archaeological excavation is complete, MOLA’s experienced team of specialists will undertake rapid assessment of the human remains. This process enables us to provide an accurate costing for further work. The analysis of human remains provides us with the most direct evidence of populations and people of the past and can hugely impact on modern medical advancement. The research and publication record of MOLA’s osteology team is unprecedented.